HIGH LEVEL DRUM ALARM alarm with flashing LED and a loud buzzer stops overfilling. Always on duty because the liquid suction tube is permanently attached to the alarm unit. It can go anywhere because its battery powered. No need for power outlets. Uninterruptible battery power lasts for years. Lithium battery included. Transfer to a new drum is easy: no need to fiddle around with tube connections. A functional check is simple – just lift the Drum Alarm out of the drum. Our overfill alarms for drums lets you pump liquids into chemical drums and containers without having to check the level. When the level gets above the float switch, a loud buzzer sounds and LED flashes to let you know. Easy to install the high level Drum Alarm: once the battery is installed, simply drop it into a drum and you’re ready to go! No wiring. Lets you forget about overfilling for good. 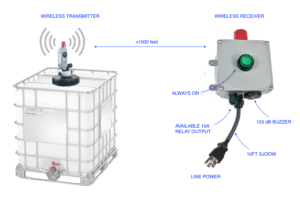 These liquid level alarms can be adapted to any drum. For example the mounting cap on the DHA-5 Drum Alarm makes it easy to switch to a new drum when the old one is full since you don’t have to disconnect tubing while you unscrew a cap – it just drops over the bung. The cap keeps debris out of the drum, and suppresses vapors even liquid ammonia. Alternatively, there are threaded styles that mount on 2″ NPS, 2″ Buttress, or 3/4″ NPT drum openings. The Drum Alarms come with or without attached feeding tube. The DHA-5, DHB-7 and DHP-7 drum alarms with attached tube guarantee the alarm stays with the feed pipe so an operator cannot forget it. 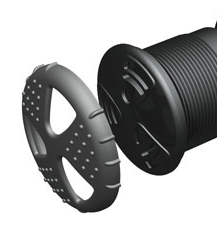 Your tubing is secured with a polypropylene compression fitting to eliminate chance hose disconnection or air leaks. Float switch is protected inside a rigid pipe so it can get knocked around without worry – a feature unique to Gizmo Engineering. Adjustable depth on all models with no tools required. Just loosen the thumb knob and slide the pipe to set the desired depth. orks through power failures, can’t come unplugged. And, because the Drum Alarms don’t use any power until alarming, the batteries last for years. Nevertheless a battery test button is included on all models. Built for tough industrial environments. 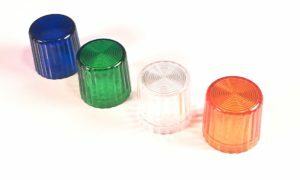 Waterproof, acid -proof, PVC housing, with Lexan LED lens, stainless steel buzzer diaphragm. No matter what your environment, these are guaranteed against all hazards for one year. DHA-5 has a slip-on cap that is quick and easy to transfer from drum to drum. Depth is adjustable with a thumbscrew from 1-5 inches. Liquid feed pipe is welded to the float pipe so it can’t be forgotten. DHP-7 has a threaded drum plug mount. 2″ NPS thread. Working depth is adjustable from 1-7 inches using a thumbscrew. Liquid feed pipe is removable to allow the drum plug to unscrewed without winding the liquid tubing. DHK-7 is an alarm only and does not have a liquid pipe. Mounts on the drum in the 3/4″ threaded bung. Can be adjusted from 2″ to 7″ working depth. (DHB) 2inch Buttress (57 mm). Here is a breakdown of the part number DHP-PP-55G for example. D ………………… for drum mounting. Slip-on cap. With liquid feed pipe. 2″ NPS thread. With liquid feed pipe. 3/8" O.D. (default) 1/4" O.D. 1/2" O.D. 5/8" O.D. 3/4" O.D. 2″ buttress thread. With liquid feed pipe. The Drumalarm already comes with a Button that tests the unit: this option adds a circuit that allows an operator to silence the buzzer while LED continues to flash. Resets automatically. Includes a low battery warning.